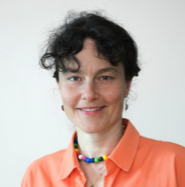 Kristin Tessmar-Raible studied biology at the University of Heidelberg 1995-2001, intermitted by a ten months research practical in Gary Ruvkun’s laboratory (MGH/HMS, Boston), supervised by Oliver Hobert and investigating the gene lim6in C. elegans. She next studied the role of the transcription factor Six3 in vertebrate eye and brain development, working in Jochen Wittbrodt’s lab (EMBL, Heidelberg) for her Diploma thesis. A side project with Detlev Arendt, post-doc in the Wittbrodt lab, fueled Kristin’s interest in nervous system evolution. For her PhD kristin initially had all arranged to study Drosophila synaptogenesis in Corey Goodman’s lab (UC Berkeley). He left academia, so after a re-orientation period of about 6 months, she decided to study the origin of the vertebrate brain hormonal systems using the slowly-evolving bristle worm Platynereis dumerilii. For this M. Hassel (University of Marburg) was her official PhD supervisor, and she was a scientific visitor in D. Arendt’s lab (EMBL, Heidelberg). Kristin discovered the Platynereis ciliary-type Opsins, cloned several key hypothalamic marker genes, investigated the expression and concluded that a medial forebrain area exists in Platynereis, which is highly similar to the developing vertebrate preoptic area/hypothalamus. In fall 2003 Kristin wrote her PhD thesis at home, defended at the University of Marburg, and returned to EMBL as post-doc in June 2004. She subsequently identified two likely ancient sensory-neurosecretory cell types. One of them is light-sensory. Kristin started her own lab in June 2008 with the question what function these non-visual photosensory cells serve in today’s annelid and vertebrate brains. Since its beginning, life has been exposed to the periodic changes of sun and moon. As an adaptation to these periodic changes, major processes in metabolism, physiology and behavior are rhythmic. The larger vision for my research is to understand the molecular and cellular principles that generate these rhythms of life. There are two main aspects to it. First, a light sensory aspect: Light serves as major cue for the synchronization of rhythms in animals. Thus, one central vision for my research is to investigate how solar and lunar light are sensed by animal nervous systems and how this light information impacts on the animals’ information processing and their endogenous clocks. Second, a chronobiological aspect: Whereas decades of molecular and cellular research have unraveled key principles of circadian clocks (period length: about 24hrs), even the basic mechanisms of clocks with periods other than 24hrs are unclear. Yet, many organisms time critical aspects of their life using such non-circadian clocks. The fundamental knowledge gap likely reflects the fact that no suitable model system has been available to study non-circadian clocks on the molecular and cellular level. Thus, another question of my research is to unravel how oscillators with different period length work and how they can interact with each other in the same organism. Our animal species, medaka and zebrafish, as well as the bristle worm Platynereis dumerilii and the midge Clunio marinus, were chosen, because they are biologically and technically particularly well-suited to address these questions.